The American Helicopter Society (AHS) International announced this week that it has selected the Daniel Guggenheim School of Aerospace Engineering for inclusion in its Vertical Flight Heritage Sites, a distinction earned by just 10 sites worldwide. More details and news about the school of AE here. 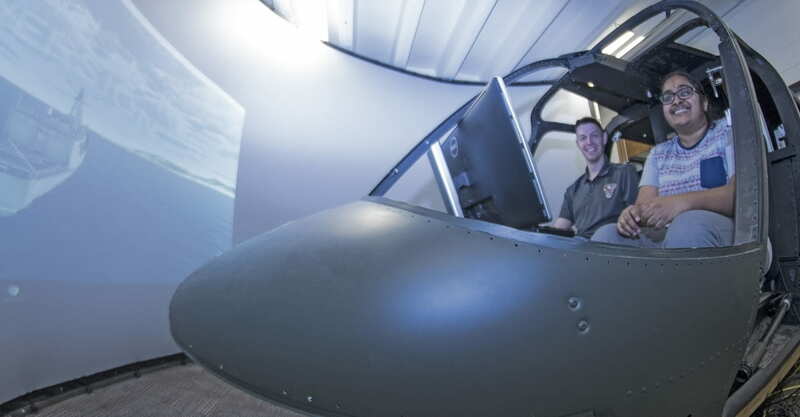 A new Rotorcraft Simulation Lab in the Montgomery Knight building is is under development. More details and full story here. Congratulations to Aarohi Shah for being selected as the 2018 Atlanta/GT Chapter winner of the AHS Robert Lichten Award! More details here. Two Georgia Tech School of Aerospace Engineering teams have earned honors in the 34th Annual American Helicopter Society (AHS) Student Design Competition (SDC). The graduate team entry, SWARM”, placed second in the graduate division, while the GT undergraduate entry, “24 Hour Buzz”, placed third. Since the AHS SDC started in 1984 GT teams have captured first or second place in the graduate category 35 times and first or second place in the undergraduate category 22 times. More details here. 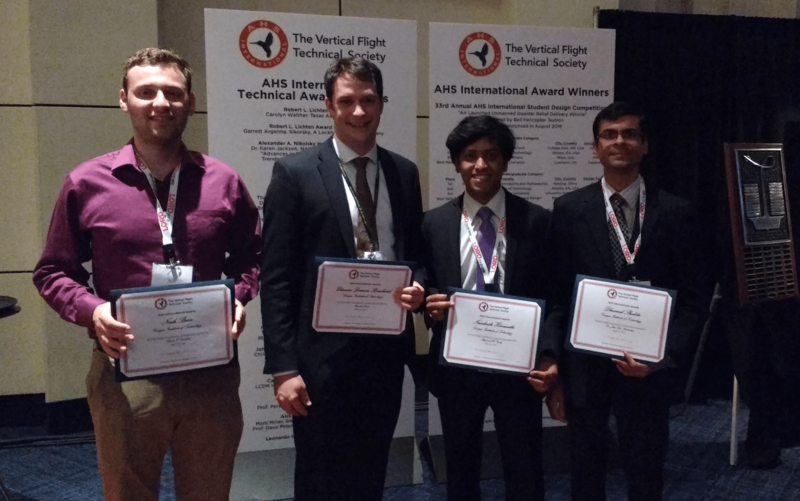 Four Georgia Tech students were awarded AHS Vertical Flight Founstation (VFF) Scholarships: Noah (Adam) Bern, Etienne Demers Bouchard, Nandeesh Hiremath and Dhwanil Shukla. The awards were given during the 73rd annual AHS Forum Grand Banquet, in Fort Worth on May 10th 2017. More details about past winners and VFF here. Congrats to this year’s recipients! The Georgia Tech Center for Advanced Machine Mobility displayed the novel Robotic Landing Gear (RLG) system at the 2017 Army Aviation Mission Solutions Summit, sponsored by AAAA. 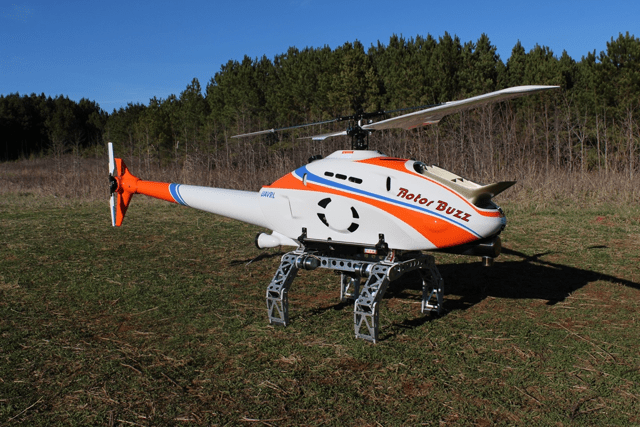 The RLG system improves the operational capability of rotorcraft by enabling landings on steeply sloped or rough terrain that a rotorcraft with conventional landing gear would be unable to land upon. The project is currently in its second phase, and the team is developing a RLG system for a 400lb UAV with sponsorship from DARPA and in partnership with Boeing. The professors currently involved are Mark Costello (PI), Claudio Di Leo (co-PI) and Julian Rimoli (co-PI).